Summer has pretty much arrived in the Bay Area, so I worked on my summer vegetables this weekend. This summer I am doing a variety trial on 20+ varieties of beans. I don't have room in my raised beds for all of them (at least, not if I want to grow squash and tomatoes as well), so I spent my time finding other places in my yard to plant at least a square foot of each type. This was trickier than it sounds, since the vast majority of the varieties are pole beans. That means the planting locations had to have some kind of structure at least six feet tall from which I could string twine to let the beans climb. I ended up splitting up the varieties into groups of three or four and planting them in clusters near spots where I already had some kind of trellis in place. I managed to plant all the pole varieties except one, which I want to save to plant in one of the raised beds with better soil, since it's a rare variety of which I only have a few seeds and I don't want to risk any germination problems. I'll probably plant that and the bush beans next weekend. In addition to that, I set up another bamboo tripod in the front yard for a batch of white runner beans. They won't be part of the variety trial, though, since they're a completely different species. The spring artichoke season is coming to a close. I steamed a huge pot full of them today (though that only results in a few cups of usable artichoke). There are a lot of baby ones still out there, but the main flush is pretty much through. 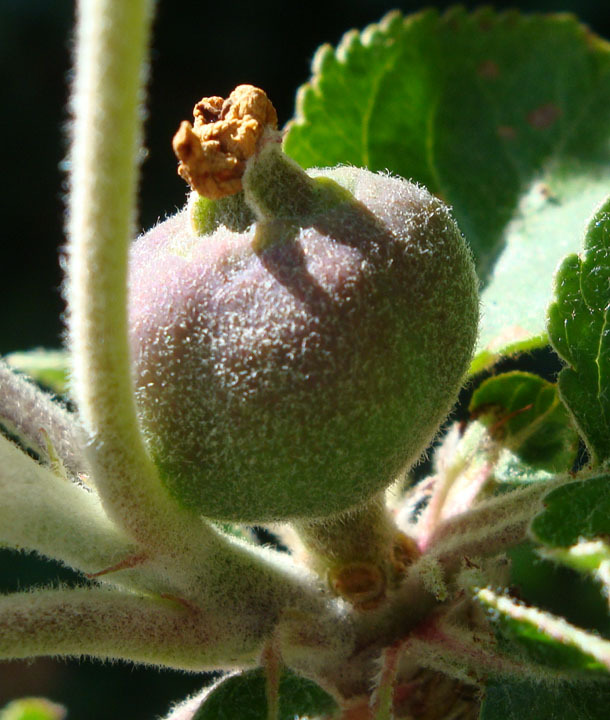 Speaking of babies, one of my apple trees is showing signs of baby apples. I'm trying not to get my hopes up too high for a harvest this year, because I know that a lot of fruit trees have a period of fruit drop in early summer and they might all fall off. I'm keeping them pruned so that there is only one baby apple per blossom cluster, though, which means there's a chance that there are few enough fruits that the tree will be able to support them and won't have to drop any. The artichoke is truly one of nature's least efficient people-foods. The main advantage of it is that it's a perennial, so you only need to pay for buying it once and you get food from it for years. Also, it takes very little time investment to care for it. Just a few minutes a week for watering and picking snails off it. No! Don't tell me. I'm always asking what kind of fruit, and I need to learn to remember the answers. This one is in the picture. I also have some baby apples on this one. My third apple tree is smaller than the other two and hasn't blossomed yet.